Wash the radishes and their greens and dry well. Cut the green leaves of the radishes, leaving some intact. Transfer two thirds of the butter to a heatproof bowl and set over a pot of simmering water. Whisk constantly until the butter is melted but still creamy. Remove from heat and whisk in remaining butter until it’s opaque and smooth. Dip the radishes halfway in the butter once, then again, and gently shake off any excess. 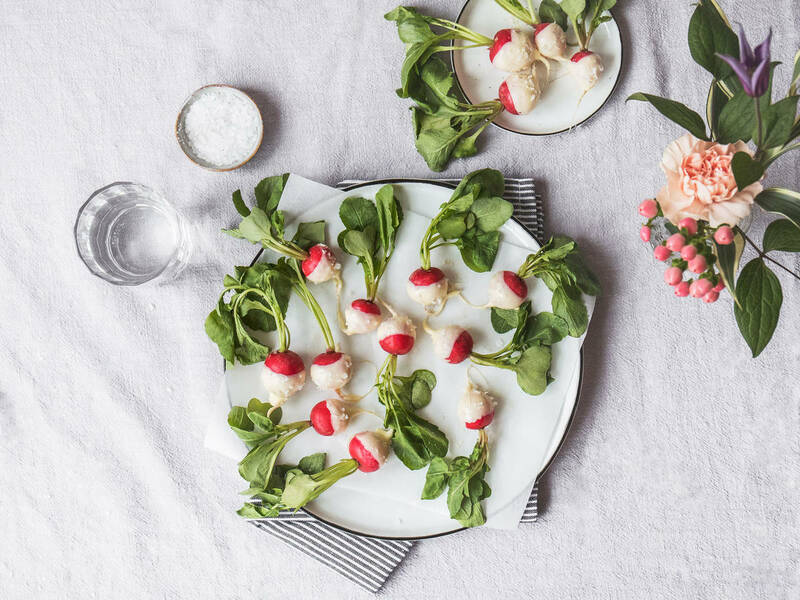 Sprinkle some flaky sea salt over the butter dipped radish and set on a parchment lined plate. Refrigerate until butter is set, approx. 10 min. Serve immediately and enjoy!